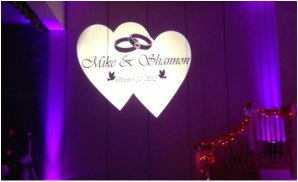 Portland Wedding Lights offers professional event lighting & rental services for Portland, Oregon, and all surrounding areas. 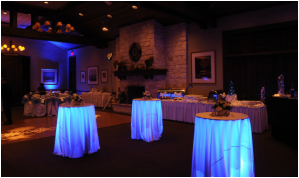 We feature the most innovative wireless uplighting fixtures, perfect for event lighting applications inside and outside. Whether it's your wedding, birthday party, corporate event, fundraising gala, bar/bat mitzvah, quinceañera or any other special event, we have the expertise necessary to turn your vision into a stunning reality. Our goal is always to deliver amazing results and professional service! Don't make the mistake of letting your beautiful cake disappear in a dimmed ballroom. 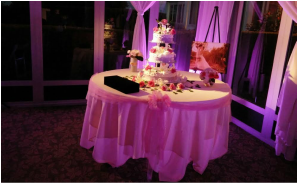 Our Pin Spot lighting engulfs your cake in a warm-white glow, ensuring it is seen and appreciated by all your guests, well before the first bite. 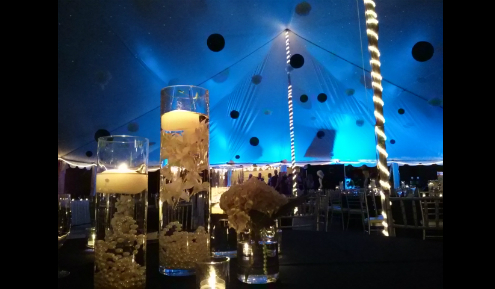 Planning a rustic barn wedding, a vineyard wedding, or a celebration under the stars? We can create and install stringed lights (also called bistro or café lights) and illuminated lanterns to create that elegant yet festive and rustic vibe. Learn more. 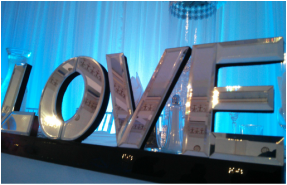 We can design event draping solutions to further embellish your ceremony and reception. Services include backdrop draping behind your head tablel, drape treatments to cover unsightly walls and windows, ceremonial backdrops and ceiling swagging. Learn more.